Paid holiday entitlement is defined by the International Labour Organization (ILO) as ‘the annual period during which workers take time away from their work while continuing to receive an income and to be entitled to social protection.’ By law, workers are entitled to take a specified number of working days or weeks of leave per year, which allows them an opportunity for extended rest and relaxation from their workplace. Taking time off work is essential for workers to not only recharge their batteries and maintain personal relationships, but also to decrease work-related stress and fatigue. Studies show that employees who take their full entitlement are happier, more productive, more focused and less likely to take sick days. However, in today’s busy work environment where targets and expectations are increasing, fewer workers are taking their allocated holiday entitlement which is leading to undue stress, dissatisfaction and in many cases extended sick leave as a result. Statistics suggest across the board four in 10 people don’t take their full entitlement each annual period. In an effort to combat the deterioration of workers mental health and the resulting loss of revenue for companies, holiday leave is regulated by countries and associations to help improve the worker’s work-life balance. Similar to other forms of leave (sick leave, maternity, paternity, parental leave, carer’s leave, etc. ), holiday leave entitlement varies across the world. While the ILO recommends the minimum of three weeks paid holiday entitlement, each country has their own different legislation and different holiday entitlements. For example, as per the EU Working Time Directive (2003) all European countries have a minimum of 4 weeks’ holiday leave, whereas in South Africa, the minimum holiday leave is 15 days. In Latin America, there is no minimum holiday leave period across the region and holiday leave varies greatly in each country. In Brazil, holiday entitlement is 30 days yet in Argentina workers only receive 14 days holiday leave per year. It is important for employers to know that not only does each region have different regulations but also no two countries in that region are the same. Many factors need to be considered when calculating holiday leave entitlements including, the region, the country, the seniority of the worker, the numbers of days worked and the length of the worker’s employment. It’s also important to consider that some countries grant workers extra leave days depending on when their public holiday falls.In the following sections, we have outlined information and graphs on the statutory minimum holiday requirement for Europe, South Africa and Latin America which includes information on public holidays, holiday pay bonuses as well as other aspects that need to be considered when thinking about holiday leave entitlement. For member states in the European Union (EU) and other European countries (Norway, Iceland and Switzerland), employers follow the European legislation Working Time Directive (2003). This directive sets the maximum weekly working hours and minimum periods of rest and minimum annual paid leave to all workers in the European Union. As with all other Directives, the Working Time Directive is transposed by each country into their own legislation and varies depending on each country’s own social, economic and cultural circumstances. Holiday leave entitlement varies in each European country due to different factors such as number of workdays per week, length of employment and seniority of worker. The EU Working Time Directive (2003) states that all European countries have a minimum of 4 weeks’ holiday leave. However, some countries grant their workers above the minimum holiday leave entitlement ranging from 25 days in Austria, Denmark, France and Sweden to 28 days in the UK. In South Africa, the minimum holiday leave is 15 days as per the recommendation of the ILO. 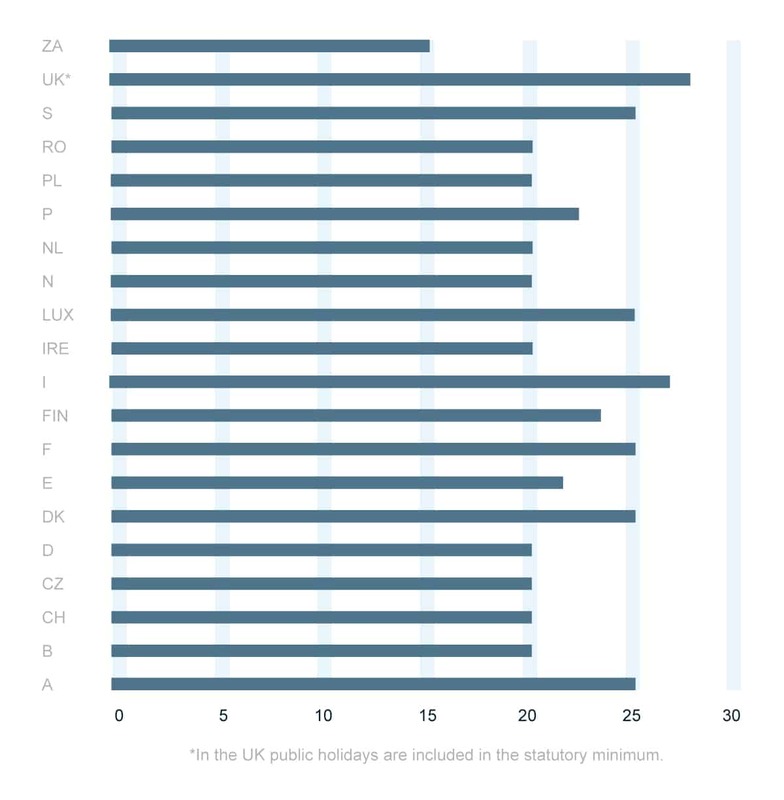 Public holidays vary in Europe and as such we have not included them in the graph. Public holidays in Europe are mandatory and are added on top of the annual holiday entitlement. Each country has its own number of public holidays, which can vary from region to region as well as year to year. In some countries, if the public holiday falls on a weekend the following Monday is given to compensate. For example, in Ireland their national holiday, St Patrick’s Day falls on 17th March each year or in Belgium their national day is on the 21st July. In addition to holiday leave entitlement, in some countries employers must pay a holiday pay bonus as well as accruing for holiday. In some countries, holiday pay bonus is mandatory and is paid out once a year in addition to the worker’s salary. The amount of the holiday pay bonus varies in each country. For example, in Belgium the holiday pay bonus consists of a single paid instalment that is equal to a full day’s remuneration, which is paid when the holiday is taken as well as a double pay which is equal to approximately one month’s salary and is paid in May or June every year. In other countries such as Denmark, Norway, Sweden and the Netherlands, the holiday pay bonus is a percentage of the gross salary and is paid in May or June. The percentage, however, vary drastically from country to country. In Denmark, it is an allowance of 1% of the gross salary, however in Norway it consists of 12% of the previous year’s overall income. Sweden has the lowest percentage with 0.43% of the average wages whereas the Netherlands have in principle 8% of the employee’s gross annual salary. Accruing for holiday is common in some European countries. For example, in the Nordics, holiday pay is accrued in the first year of the worker’s employment. During the workers first year of employment, the holiday leave they take is unpaid which means holiday taken in the first year is unpaid. Given the fact this holiday is accrued, when the worker leaves, regardless whether he gave in his notice or was terminated, he will receive payment of his holiday amount from the first year. Effectively, this means that it is only really during your very first year of employment that you receive unpaid holidays. Holiday entitlement in Latin America varies widely from country to country and depends on many factors such as number of days worked per week, seniority and number of years of employment. holiday entitlement of 30 days. The two other countries, Colombia and Chile grant the recommended ILO holiday entitlement leave of three weeks. Public holidays in Latin America function similarly to Europe and are on top of the holiday entitlement. Each country has its own number of public holidays that may vary depending on the cities, states and regions. In some countries, if a public holiday falls on a Tuesday, for example, there is the possibility of what is called a bridge day. A bridge day is an additional day off, in this case a Monday, which falls before a public holiday. Bridge days are either Monday or Friday and enables to fulfill the gap between the public holiday and the weekend. This day can also be considered as a holiday, depending on the country. In most of these countries, there is no holiday pay bonus. However, in Mexico and Brazil, a holiday bonus is mandatory and paid out according to the country’s legislation. In Brazil, this bonus corresponds to 1/3 of the regular monthly salary and, payment must be made two days prior to the holiday start date. In Mexico, the holiday bonus corresponds to 25% of the regular salary and, it must be paid at the employee’s vacation anniversary, whether the employee takes the vacation or not. In five out of the six countries, workers can take proportional holidays accrued after 6 months (one year for Brazil) of employment, however, if a worker takes holiday before this period the days taken off are considered as Paid Time Off (P.T.O). In other words, these days will not count for the statutory holiday entitlement. When a worker’s contract ends, regardless of whether he resigns or is terminated, he must receive the corresponding proportional payment for the accrued untaken holiday. and regulations regarding the length of leave, accruals and whether public holidays are included which can make calculating a worker’s statutory holiday entitlement a difficult job for international employers. If a business is looking to hire staff in countries where they don’t have a presence and ensure they properly calculate the holiday entitlement of their workers, an Employer of Record (EOR) solution may be the answer. By using an EOR provider, businesses can leave the in-country experts to organise and provide the correct statutory holiday leave entitlements for their workers. Furthermore, an EOR provider stays up-to-date on the legislation changes surrounding statutory holiday leave entitlement, letting companies continue to work on core business matters instead. This article features in the January 2019 edition of our Quarterly Report ‘Employment Matters’. Every three months we provide an overview of the latest updates, insights and analysis regarding employment issues across Europe, Latin America and South Africa. If you would like too see more of January’s Quarterly Report as well as our previous editions click on this link.